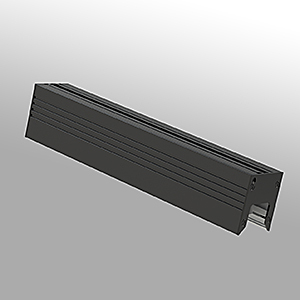 EDGE is an adjustable LED linear luminaire primarily used for vaulted surfaces. Its distinctive pivoting mechanism was developed for improving lighting control in atypical environments such as stairs or vaulted ceilings. With one simple movement, you can align, by directing all light beams together, your light perfectly perpendicular to the floor. Its great advantage also lies in the fact that each increment can be separately adjustable, thus allowing for customized lighting effects. EDGE is composed of six high-power LEDs in an aluminum linear extrusion with an integrated heat sink. Field adjustable it is set up directly onsite, thanks to a wheel which is easy to reach at all times. This characteristic gives the possibility to adjust the tilt angle up to 45°, both to the left and to the right. Its precise application and easy-to-use package are appreciated and recognized by our customers. All of our lighting fixtures are tailor-made. EDGE comes with interchangeable optics, thus allowing for various light beams. The temperature color and finish can also be customized according to your preferences. To suit your project in the best possible way, mounting brackets are also provided. Available in 8.5 W/ft and 12 W/ft. 48” length (1.2 m) – 18 AWG wire lead with WAGO quick connector. High thermal conductive extruded aluminium. High powered LED mounted on MCPCB. High performance aluminium forged pin heat sink. 45° light angle adjustment both to the right and to the left from pivoting mechanism. (Extrusion inside is always painted white). Nominal dimensions do not include mounting options. * Available for tailor-made application. Please contact your Eklipse representative for further informations. The length of a linear lighting fixture is always calculated in inches. Please refer to the multiple scale to order the appropriate multiple length for your project.